I recently found a summary of all of the cutting edge research and advancements in the field of autism for the year 2012. “The 2012 Summary of Advances in Autism Spectrum Disorder Research” is filled with summaries of fascinating studies that cover topics from early diagnosis, to successful interventions, to environmental factors that appear strongly correlated to a child being born with ASD. I have been reading through it all night and just had to share. It’s about fifty pages of awesomeness. The following article is only an introductory look at using functional communication. However, it lends good perspective to the plight of the individual with autism when engaging in the real world. I specifically like the idea of getting “EVERYONE” involved when practicing a new phrase, ignoring (as much as possible) the negative behavioral (especially if it’s attention seeking), and reinforcing the positive new skill (using a learned new phrase). Praise is a wonderfully meaningful thing that parents can give to their children. However, sometimes when we don’t get the response we were expecting (a smile or a recognition of any kind) we stop giving it as often/at all. Don’t let a cold or indifferent response stop you from praising your child. As a child therapist, I see and hear children yearning for praise from their parents everyday. A child recently shared with me how hurt he was when his parent lauded over his sister’s improvement in school and then turned to him and said “you’re making progress”. He needed more, even though he’d never ask for it. This is just one example of many. Two rules to keep in mind. Rule 1: When you give praise to your child, don’t expect that the praise will be received in the way you hoped. Recognize that it’s being absorbed regardless and allow it to sit, without further discussion if not welcomed by your child. Think of it as something being stored in the bank for later. Rule 2: Don’t push for a response. If you push for a response that indicates he/she “really believes/accepts it”, then you’ll end up changing the initial intent (praise), and instead shift to a discussion on why he/she can’t accept praise (no longer feels good and refocuses on the negative). You’ll also likely appear annoyed, mad, or hurt, which again has a much different effect than initially intended. SUMMER Schedule is here….and it’s awesome. 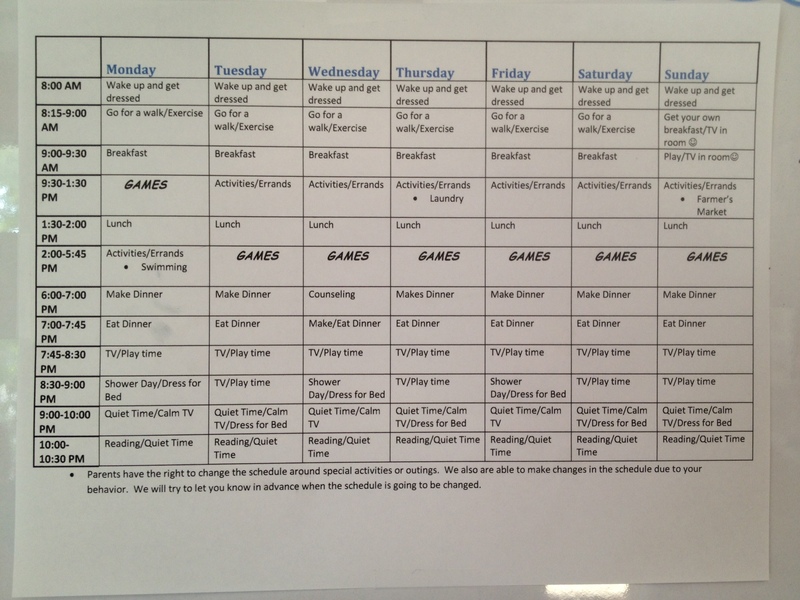 Another awesome parent recently sent me her summer schedule. She stated, “I’m not going to have another summer like the last one”. She has reported great success with this schedule so far. Her son is 12 years old. The schedule is so clear I really don’t need to explain anything (which is why its great). This is of course tailored to the summer, so you will notice a decent amount of GAME/FREE time. I think it’s really phenomenal, easily adaptable to any kids life, and could be supplemented with visuals without much fuss. If you send me your email (spectrumshareconsulting@gmail.com), I will provide you with an editable copy of this schedule (so you can tailor it to your life).